Fabinho joined Liverpool from Monaco in the summer in a £43.7m deal, but found game-time difficult to come by, starting just five Premier League games in the first half of the season. The Brazil international worked his way into the team by November and has been a regular since, missing only the trip to Burnley, where he was an unused substitute. "I am happy. 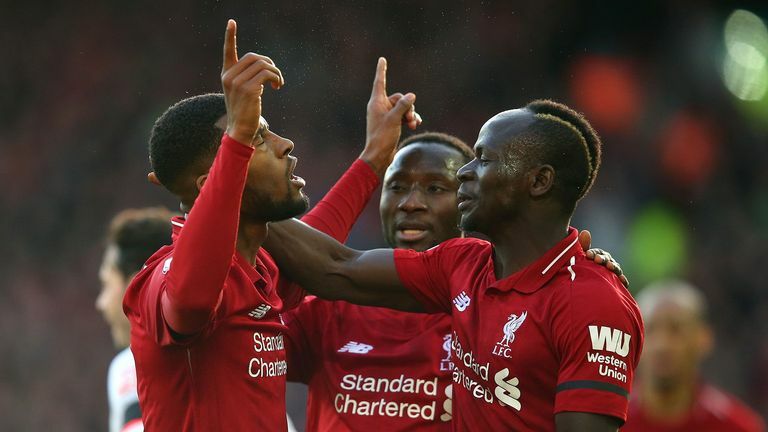 I still have things to improve but I am happy overall with my performances, I am up to the speed of the Premier League and that was what I was looking for," said Fabinho. Fabinho was part of the Monaco squad that won Ligue 1 and reached the Champions League semi-final in 2016/17. Liverpool are second in the Premier League behind Manchester City on goal difference, but the Merseyside club have a game in hand. Fabinho added: "I had a good season with Monaco, we scored a lot of goals and we had joy playing football and we have to do it here as well, enjoy the games and go on the pitch with happiness and go game by game. "I know it is really hard to win a league, especially the Premier League, but we have experienced players here at Liverpool. He had missed first training session on Tuesday after suffering a minor muscle complaint, while Milner took part in separate session away from the rest of the squad following an illness. A statement read: "Alex Oxlade-Chamberlain, Rhian Brewster, Ben Woodburn, Nat Phillips and Xherdan Shaqiri maintained their rehabilitation programmes during the morning session in Spain. "Meanwhile, James Milner and Fabinho resumed training alongside their team-mates."